OS OpenData Meridian 2 rendered with OpenStreetMap’s Mapnik. Photo on Flickr. Map data: Ordnance Survey. Apologies for not writing about this sooner; we have been busy and all sorts. 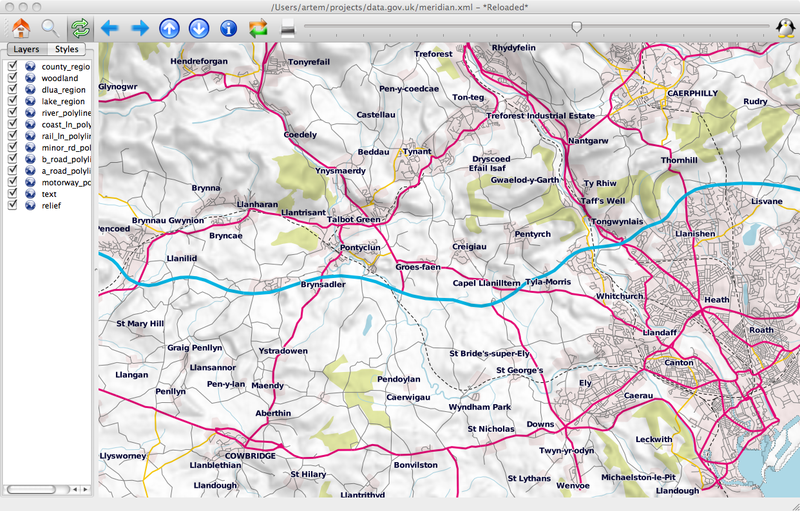 So, go get your Ordnance Survey data. As you’ll surely have noticed, Ordnance Survey has made a chunk of data available for free personal or commercial reuse, under a licence that equates to Creative Commons Attribution – you have to say what’s in it. Disappointingly the 1:25K and 1:50K datasets (Explorer and Landranger) were not released – this has been a huge disappointment to paper mapmakers and others who wanted to do some innovative things with them. The Ramblers’ Association in particular had really been hoping for those. Great stuff with the Boundary Line data, CodePoint (postcode to lat/long) and Meridian data. CodePoint on its own is saving lots of people lots of money – Cyclestreets reckons that’s £2,000 of money it doesn’t have to lay out annually to run its site. OpenStreetMap is still discussing the implications of the licence and whether it wants to import the data. But it has set up a parallel project which uses it. For us, this doesn’t feel like the end of the road; it’s much more like the beginning, where now we have to see what people are going to do with it to prove the usefulness of the idea. And of course there are so many more potential data sources that should go free – tide times and flood maps being two which spring to mind. Come on, UK Hydrographic Office and Environment Agency.